Professional Listing Photography. Sell It. I shot this beautiful modern in Victoria Park for Larry Wallenstein of Re/Max Consultants Realty 1. Let me help you too! Are you selling your home "by owner?" Are you selling your home "by owner," AKA "FSBO?" Do what professional realtors do: Use professional photography for your listing. It's more affordable than you think and the ROI is tremendous. Call me at 954.914.5028. Visit my website at www.dr1graphics.com. Email me at David@DR1Graphics.com. Get sold. "Do you do weddings, too?" In and around S. Florida, I mostly shoot real estate for listing purposes. As I continue to build my business, I've really enjoyed meeting new people. Lots of my new contacts have asked me, "Do you do weddings, too?" My answer is always, "Of course I do weddings!" Then I add this caveat, "But I never do FIRST weddings." Listen. I'm retired. My work in photography is an enjoyable, largely non-stressful endeavor. It's a retirement job. I like working with people who are a little older, a little seasoned, sometimes maybe a bit rough around the edges. Someone who's not too demanding and goes easy on themselves, their partner, their family and friends, and those around them. So, I choose to limit my wedding work to someone's second or third (or more) try. Most couples at this stage in their lives have already gotten over some pretty difficult moments and deep disappointments, and likely, some pretty wonderful ones too. They've got real life experience and realistic expectations about other people. That works well for me. So, if you're thinking about your second or third (or more) wedding, let me know. I'd love to do it! Call me! Wait a second... There are a few more caveats. 1. Pick a great location, like a beautiful beach at sunrise or sunset, on a cruise ship or pleasure yacht, in a hot air balloon, etc. I'd love to shoot a wedding in NYC on the High Line! 2. Have good food. Please invite the photographer to join you in the bacon-wrapped (anything), lobster bisque, oysters, petit filet, sautéed asparagus, etc. He is always hungry. 3. Mix awesome cocktails. These include cucumber jalapeno margaritas, a great single malt scotch, or a traditional vodka martini. (Is that an oxymoron?) Okay, I'm really not that picky about the cocktails. Moonshine will do if that's the house drink. The fine print is officially out of the way. NOW you can call me. It doesn't happen every time I go on a shoot, but when it does, it's golden. By that, I mean that sometimes, I run into some pretty cool people. Yesterday, while shooting a nearby listing for a local agent, I went down to the pool to get some "amenities" images. Because of the rain and thunderstorms moving through the area, the pool and surrounding cabanas were empty, except for the gent pictured here. While his shirt says he's "Not A Morning Person," Frank was as happy as a pig in poop - the master of his 6x8 foot poolside recreational space. Maybe the Budweisers helped his demeanor, but he was great fun to talk with and he made an interesting - and unexpected - portrait subject. Are you a real estate agent? Then you know it’s a jungle out there. When you look around at the competition, it isn’t just the volume of agents in this busy market that challenges your success. Market trends, interest rates, mortgage security, and more recently, the erosion of consumer confidence in real estate professionals – these factors too affect your outcomes. Results of a study commissioned by the National Association of REALTORS® in 2015 noted that “uneven professional standards” were yet another consumer concern. As the real estate business weathers these diverse challenges, every detail of every transaction and interaction that you participate in takes on new meaning and importance. If you don’t regularly ask yourself, “What am I doing to set myself apart?” then you are, as they say, planning to fail. One way to rise above the crowd is to establish consistent business practices. Ensuring that your brand is reliable in every respect places you far ahead of other agents who miss this critical detail in reputation building. In the age of the internet and instant information, potential clients seeking a real estate professional are likely to vet your brand before their first call to you. That means researching you and of course, heading over to your webpage to look at your listings. If they don’t like what they see, they’ll move on – quickly. Does your webpage (and your brand) reflect obvious consistency in the delivery of your product? Regardless of price, do all of your listings appear carefully constructed and presented, explicitly conveying the level of professionalism with which you treat every client? An easy way to synchronize your brand with consistency is to always use professional photography in your listings. While numerous studies have shown the importance and value of using professionally taken and finished photos for real estate listings, many agents resort to iPhone or point-and-shoot proxies as substitutes and shortcuts for quality images. Worse, some agents use professional photography inconsistently, implying, through their listing sites or the MLS, that some clients are more – or less – important to them than others. Re-read the three bulleted questions, above, and reflect on what you are doing to set yourself apart from your competition. Then consider professional photography as a means to help you stabilize and build confidence in your brand in this highly competitive and challenging environment. Check out this article from Redfin on the benefits of hiring a professional photographer to help market your property. Sell FASTER for MORE MONEY! I also know that my favorite model, my wife Linda, hates it whenever I stick my camera in her face. Which happens a lot. So, in the interest of keeping wifey happy - and learning the nuances of studio style portraiture - I'm stuck with the only model who follows my direction without much complaint. Me. It's not pretty. But it is insightful to me. I'll post my experiments from time to time. Sometimes the only camera that's handy is the one on your phone. Not necessarily a bad thing, especially when a unique scene (and the opportunity to capture it) suddenly presents itself. 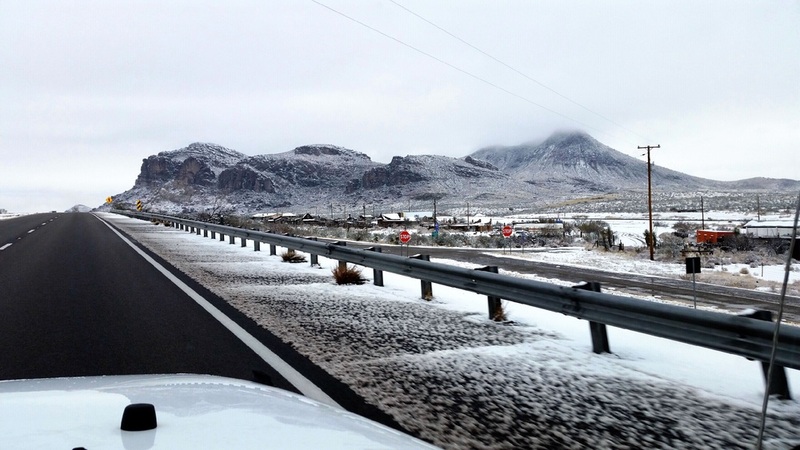 This cell phone picture was captured by my daughter, Lauren, who just completed a cross country trip which traversed a snowy I-10 near Tuscon, AZ. I like the look across the hood of her Jeep down the asphalt, the gray-white sky and ground, and the vibrant colors of the street signs. Look closely if you can't see them right away. It's an interesting composition. Lauren, a U.S. Navy corpsman, is reporting to MCAS Miramar in California this week and begins training for an upcoming deployment to the Middle East. Lauren's an accomplished photographer, too. While her job at Naval Hospital Camp Lejeune gave her some training and experience with a camera, I like to think maybe I had a little something to do with her instincts and eye for a good shot, even if it's taken with just a cell phone camera. I've owned DR1Graphics.com for some time now, but have just recently recovered enough lost photo data from bad hard drives to start a portfolio. As you might expect, re-discovery is often more time consuming than original discovery. So, be patient as I dig through the archives to pull out some pictures that best represent the photography I'm most interested in - and which demonstrates the skills I've developed over the years that might be interesting to you. I'm available for events (small weddings, reunions, graduations, etc. ), real estate marketing and promotion, corporate photography, travel promotion, and even low altitude perspective photo and video, i.e., "drone photography." The drone is an awesome equipment adjunct, and supplements ground based photos and videos. Check out the galleries I've uploaded, listed either in the left column, or above under "Menu," depending on your browser. Lots more to come! If you have an event, idea, or project that you'd like to discuss, please give me a call at (954) 914-5028. Reasonably priced, I'm also flexible and well-equipped for location shoots.